Need support / help on your ONYX products? 1 - Why does the motor not start up in auto/apex over mode? Check that the silicon cable is properly connected to the white coupling and is then connected to the lip electrode, which should itself be in the patient’s mouth. 2 - Why does the motor not start up in Run mode? The motor may be damaged; it should be returned to the After-Sales Service. 3 - Why does the motor shut down during treatment? Check the state of the battery and charge the device if need be. 4 - What does the machine’s apex relate to? The apex indicated by the machine relates to the Dentino-Cemental Junction (DCJ). 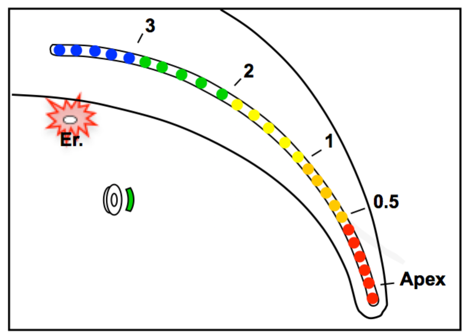 5 - Why is the torque too low, and why does the machine lack power? If the contra-angle handpiece makes a clicking noise, it should be returned to the After-Sales Service. 6 - Why is the measurement unstable and why does it yoyo back and forth on the display screen? Your irrigating agent must be too concentrated in terms of active chlorine; we recommend that you use an irrigating agent such as sodium hypochlorite with a maximum concentration of 2.5%. At a concentration greater than 2.5%, hypochlorite disrupts the root canal input measuring signal. 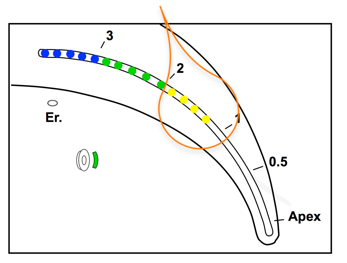 This creates virtual apexes and/or measurement errors, particularly in the first coronal third. Solution : Start the first coronal third using hypochlorite with a concentration less than or equal to 2.5%, and then use hypochlorite with a concentration of 5% (for example), leaving it for the time required for it to act. Rinse the root canal using hypochlorite with a concentration less than or equal to 2.5% and resume enlarging the root canal. Finish the treatment by using hypochlorite with a concentration of 5%. This protocol is not exhaustive but should enable the measurement to be combined with a highly dosed irrigating agent, with the goal being to maintain impeccable root canal cleaning without detrimentally affecting the measurements and functionalities of the Endy 6200 and the Locapex Five. 7 - Why is the error indicator light blinking? Excess irrigating agent: To make sure that the device is running smoothly, it is important to properly irrigate the root canal whilst at the same time keeping the pulp chamber completely dry. For a tooth suffering from gingival decay, the problem is the same, in addition to there being less possibility of isolating the root canal. 1 – The pulp chamber is filled with hypochlorite electrically linking the two root canals. 2 – The apex locator indicates a contact at the entry to root canal 1, but no information regarding forward progress towards the apex is displayed on your locator’s screen. This means the current is passing through the other root canal. 3 – Solution : Dry the pulp chamber in order to isolate the two root canals. Redo the measurement in root canal 1. 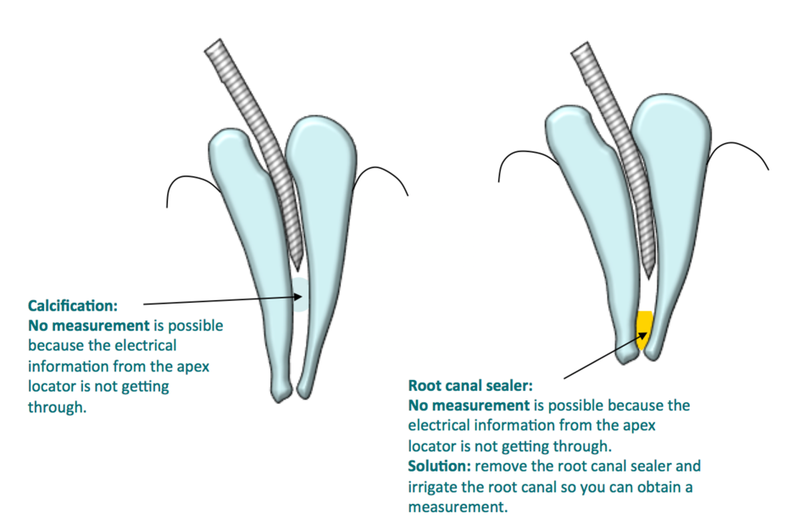 If the measurement does not start up, that means that the root canal is not permeable. Root canal 1 is still isolated using the root canal sealer. 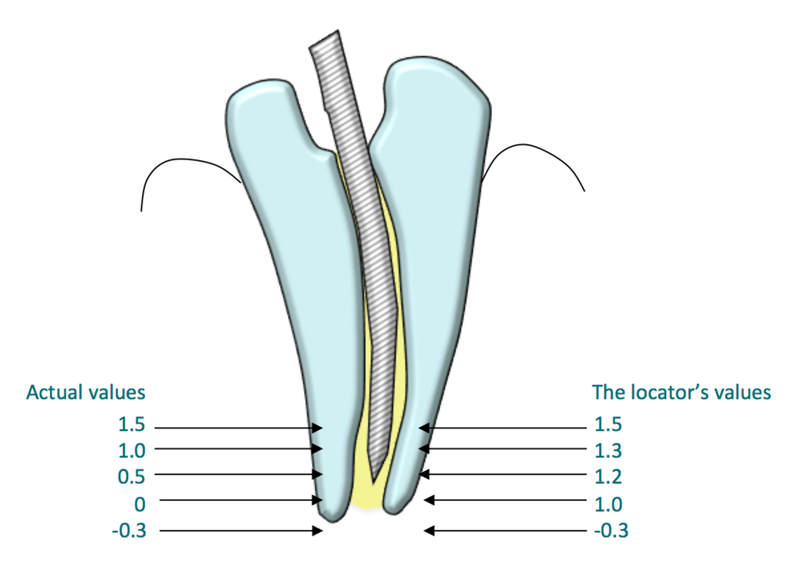 4 – Take a measurement in root canal 2 as you would normally. Conclusion: Always isolate the root canals in order to avoid mixing the information provided by your locator. 8 - What if there is a poor measurement and/or in special cases? The locator announces an apex. The problem is resolved by having taken a pre-operative X-ray which provides sufficient information about the length of the root canal. The measurement will return to normal after passing through this constriction. The measurement is normal up to the crack, and then it goes all over the place when it passes through it. Measuring becomes impossible. 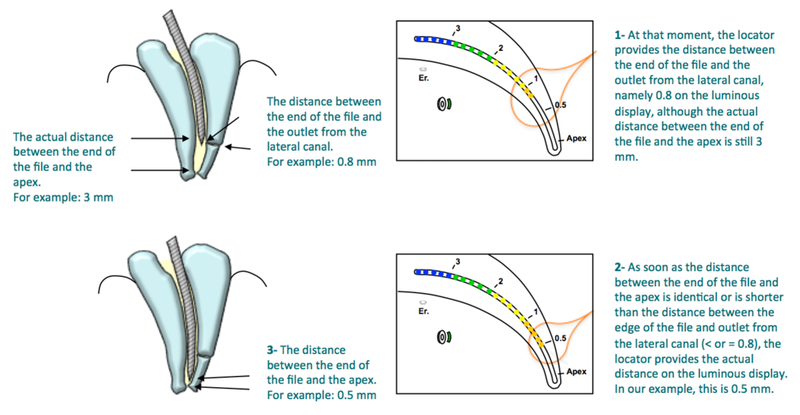 The difference between a lateral canal and a fissure: the canal resembles a tube and the fissure is a break in the tooth. There is no seal for measuring purposes. Upon approaching the open apex (1.5), the value provided by the apex locator almost stops varying. The measurement will return to normal at the foramen. 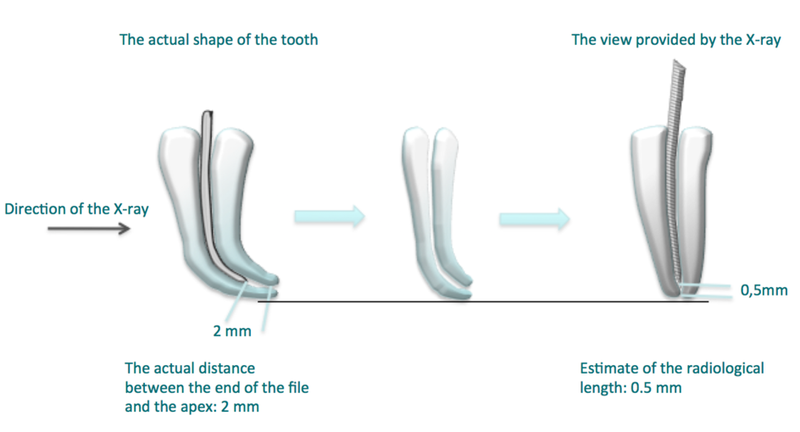 To sum up: To take a measurement in the case of an open apex, you have to find a negative value; place your stop on the file resting on the tooth. Take off one or two millimetres according to your choice. As soon as the measure becomes negative, the display will show the actual value: Apex over. To reduce the effect, increase the diameter of the file as much as possible. 9 - Why am I noting that my parameters are maladjusted? When your battery reaches the end of its life, this may cause the device to reset. In that case, it will restart with the factory parameters. 10 - Why does the apex not seem to position itself at the right spot? 11 - Why am I experiencing problems when measuring with a new file? On certain new files, there may be a greasy film on the neck; this is due to the manufacturing process. In order to obtain a reliable Apex measurement, it may be necessary to wipe the neck of the file with a paper towel in order to remove this greasy film. 12 - What is the best speed and torque to work with? It depends on your type of instruments. Each file has its own characteristics. Does your Endy 6000* seem to you to be obsolete? (instead of € 1,710 (excl. tax) (or € 2,052 (incl. tax)) – the purchase price for a new one)! ! For further information, contact us ! * Compatible with the Endy 6000 V1 and V2. Also possible to use it with the Endo Master.